With much of cottage country being overtaken by the trappings of urban living - big box stores and McDonalds - it's good to know there are still areas where you can see brilliant starry nights and listen to nothing but the sounds of nature. Dragonfly Cottage is only a 10-minute drive from Barry's Bay, but you'll feel a world away from the busy-ness of everyday life. Give yourself thirty minutes on the dock with a coffee in the morning or a glass of wine at sundown and let the relaxation flow. The cottage sits on good-sized lawned gardens with plenty of room for kicking around a ball or having a game of badminton. Enjoy great swimming from the shoreline which is grassed to the shore with a shallow walk-out deepening gradually. The dock is great for fishing or just chilling out. 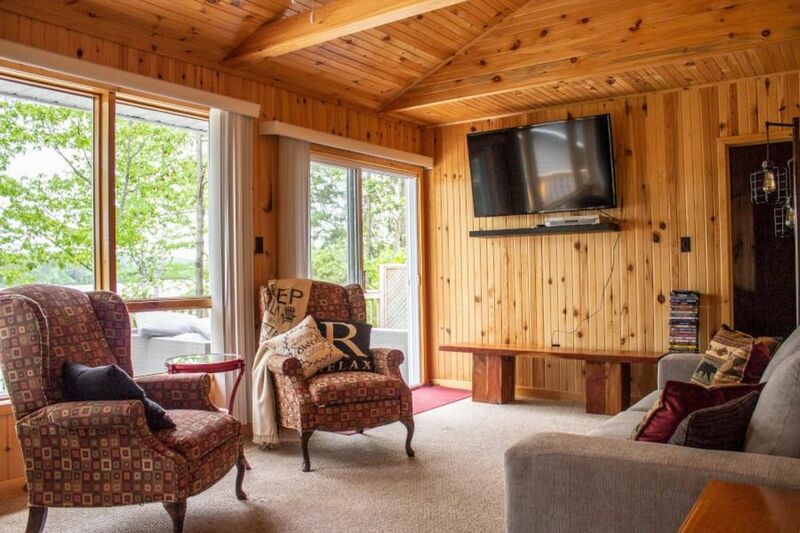 Inside this newer cottage, you'll find the living and dining area overlooking the lake and sun deck with a neat kitchen to the rear. The three bedrooms and bathroom are off the living space and are comfortably furnished for a great night's sleep. Since most time here will be spent outside, it was a pleasure to see lounging furniture on the deck for sitting out and enjoying every part of the day. If you need some activity, try white water rafting at nearby Madawaska Kanu Centre, or tour the area and do the Madawaska Valley Heritage Trail. If you are coming for the Barry's Bay Triathlon or just need to do some training this is a great base too.